The chameleon chandelier is back. Again. Handsome Hubby asked me if I was going to use THE chandelier in our Christmas decor this year. Originally I said no. I’m so glad I did not listen to me. It’s been done for Christmas, for Spring time, for Halloween…. I might do something with it for Valentine’s Day… I’ll say it again: Spray paint can change your life. I sprayed the chandy silver, clipped the little crystals off of my Thanksgiving centerpieces and re tied them onto the chandy. I love that I have something very unique and unexpected to greet people as they come up to the house. You know what else I love? That it cost me zero dollars to make. The chandy was free from someone on freeecycle.org. If you go to your local tree lot and ask them, they will give you the clippings. Treat them like roses: make fresh cuts on the ends and put them in water. They’ll last the whole season. Now I need to find another free chandelier… my mom really, really wants one for her house. LOVE IT!!!! Now I will be on a mission to find me one!! That’s awesome! I just happened to blog recently about a chandelier of my own. Don’t get excited. Yours is much better. That chandelier has paid for itself time and time again!! I love it! Looks beautiful decorated up for Christmas! This is beautiful(of course!)!!! Love the little changing chandi! Great job!! Now I want one! PURTY. Why WOULDN’T you have used it? 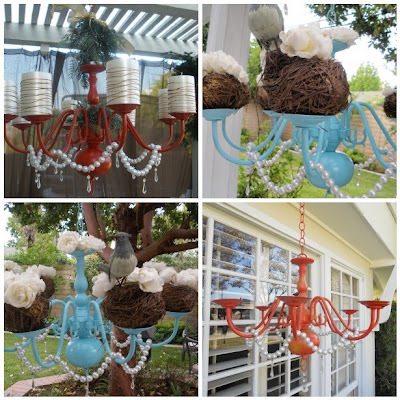 What a fun way to use and reuse the chandy. Creative!